It has been a tough week. Although I thoroughly enjoyed the trip to Kilkenny, the injuries to Bruisers Bullet and Aayamza Breeze have just brought us all back to earth. It was a long journey back from Hove on Thursday, quite literally. Closed roads meant it took us four hours to get home with a seriously injured dog in the back. As far as Bruisers Bullet is concerned, there is an overstretched TFL, with also a possible twist to his back. We knew that Aayamza Breeze had a broken hock but didn’t know how bad until Daniel Doherty operated on her on Friday. Basically, if there was a scale of one-five with five being the worst, she was probably a four and a half. Twelve days after the Dorando and this! On the plus side, Daniel was very happy with the operation and said we shouldn’t completely rule out her coming back. But it seems very small consolation at times like this. We have three at Sunderland including Rubys Rascal who looks very badly drawn on the outside of Geelo Bullet, who looks a middle runner to me. But you completely forget about winners at times like this and just hope that they will all come home unscathed. We obviously lost Bullet for the Sussex Cup but will still send along Roswell Romanov and possibly a couple of others. We keep entering Romanov at Romford but nobody wants to run against him and the races don’t fill. It is annoying but I have also avoided races if certain track specialists were taking part. 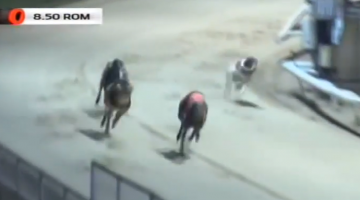 Romford in particular seems to attract dogs who are tough to beat once they get there eye in. At one stage, Eye Onthe Veto won two Essex Vase and a Champion Stakes in a couple of years. We also had Adageo Bob and of course Derek Knight had Fivestar Clipper. Obviously we need to keep Romanov ticking over so he is off to Hove before returning to Romford for the Coral Champion Stakes. I have been trying to follow the SIS/ARC battle without knowing all the details and what it will mean for us trainers. There are already rumours of trainers being offered contracts to move to other tracks, and I was also approached, though I don’t intend to go into detail. It appears that many tracks will be looking to fill the gaps in their cards with open races, even more than they already do. That has led me to a decision to consider my strategy towards open races. The first thing I should say is that nothing will change for the big competitions. Without them, and the incentive to win them, we don’t have a greyhound industry. No, I am referring to the minor open races and a topic that has irritated me for many years. I am referring to a situation where I enter dogs in open races and they are running against local dogs. The trainers of the local dogs get a runner bonus for taking part – nothing to do with prize money – but the visiting trainers do not. How can that possibly be fair? Every week, when I enter dogs, I get calls back from the racing office asking ‘do you have a dog to fill to this race, or that race?’. I have always tried to help. But not anymore. Every time I run a dog in those races, it costs me the bonus with those dogs not running graded at Towcester. On occasion, an owner is insistent that they want to go open racing, and that won’t change. But in most cases, they simply want their dogs to run somewhere. We are not talking a lot of money, depending on the track. It might be £10 for each middle distance runner and £15 for a stayer, but that would pay the diesel, or possibly help towards the wages of the kennel staff who are handling the dogs. Earlier in the year I set out to win an open race for every day of the year and that might have led some tracks to think I was desperate to win as many as possible. That is no longer the case.